Research Folders can hold up to 50,000 documents each depending on the plan you signed up for. They can be shared with other members of your team, and even with users outside your company, as long as they also have an AcclaimIP account. Research Folders are more than just a place to store the results of your searches. AcclaimIP's advanced syntax gives you the ability to find unions, intersections, and differences between folders. So essentially, Research Folders are, in themselves, analysis tools. 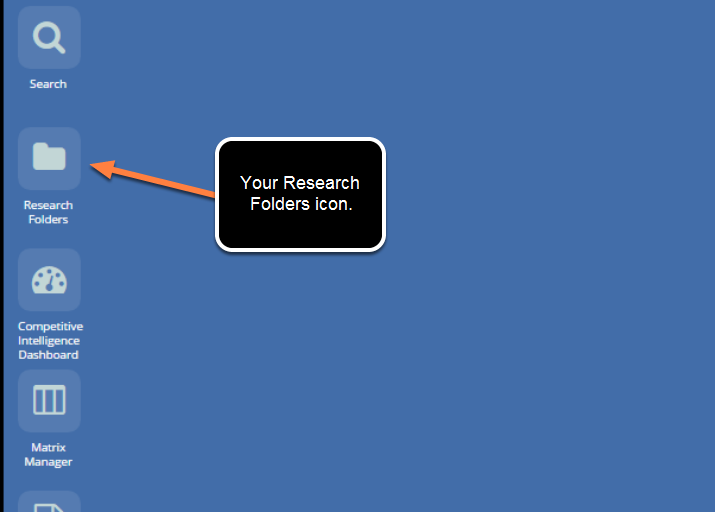 The contents of Research Folders can be charted together. This gives you the ability to chart two portfolios across the same dimensions for comparative charts. Double click the Research Folder icon on AcclaimIP's desktop to open the Research Folder window. 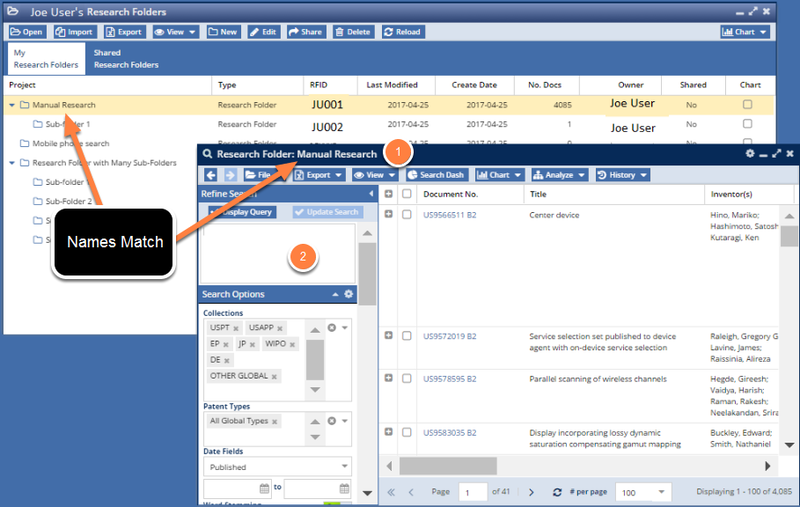 You can then manage your saved documents and searches from inside the Research Folders window. When you create a new research folder it is saved in the Research Folders window. The Project column is the name you give the research folder. The asset type can be either a Research Folder (generally containing documents, although it can contain 0) or a Saved Search. The RFID is the reference number you use when you want to reference a folder when using advanced syntax. You will use the RFID field code when composing the advanced syntax query. For example entering RFID:(JU0410 OR JU0411) into the Search window will return documents contained in both folders at the same time. Use this date to help determine if you want to archive the folder or not. Folders can be deleted or archived (for later retrieval) and removed from your view. Most folders, except those you are actively working with, should be archived. The Create Date field references the date you, or the person who shared a folder with you, created a folder. The No. 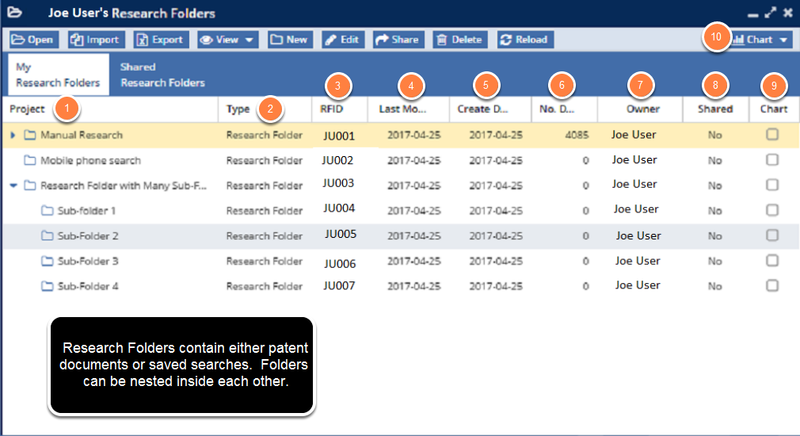 Docs column displays how many patent assets are in the folder. AcclaimIP can store up to 50,000 documents per folder (depending on your plan). This will often be your name, but not always. When viewing folders shared with you, it will refer to the owner of the folder. This indicates whether or not you have shared the document with others. 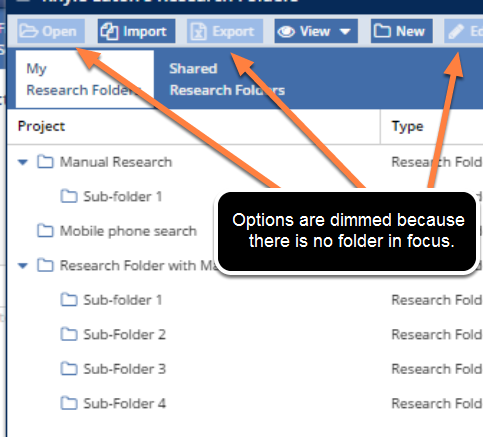 In the example above, none of the folders have been shared (i.e., under the "Shared" column, there is a "No" in every field). AcclaimIP can chart together multiple saved searches or folder contents on the same chart. Use the chart check boxes and the Chart menu (10) to create multi-series charts. One example of a multi-series chart would be overlaying two portfolios (two searches) and charting them by class to see where they overlap and where they are mutually exclusive. The toolbar is located at the top of the Research Folder window. It contains the tools you need to manage your folders and the documents within them. This includes the Edit tool, where you can change the name of the folder, add a description, move the folder, archive it, or share it. In the window above, some of the options in the toolbar are dimmed (no longer active) because there isn't a folder in focus. To put a folder in focus, just click it. Notice in the previous example that the folder called "Manual Research" is in focus. To Open a folder, either double-click the folder name, or single click (to bring the folder into focus) and choose the Open option in the toolbar. The contents of the folder will then open in a new window. Select the folder and choose the Import option. Importing patents is explained in detail in the section titled "Importing Patents from a Spreadsheet." The view menu gives you the option to view or hide both archived and active folders. Generally, you should keep the archived box unchecked, so that you can archive a folder when you are not working with it. By doing this, you remove the folder from your view. This helps you to keep your Research Folders clean and manageable. To create a new folder click the New button. This will give you a new window that will allow you to name the folder, add a description, choose its location, whether to share it, and whether to archive it. If you have a folder in focus, the system will, by default, place that folder in the Parent Folder field. However, you can always choose a different folder from the Parent Folder field drop down list. To edit a folder, such as to change the folder's name or archive the folder, click the Edit button. The Delete button completely removes the research folder from AcclaimIP. If it is crowding your view, but you don't want to completely delete it, then you should archive the folder to remove it from your primary view. Reload simply refreshes your window. This is really only used if another user shares a folder with you in real time. You will need to reload your window to see the shared folder. 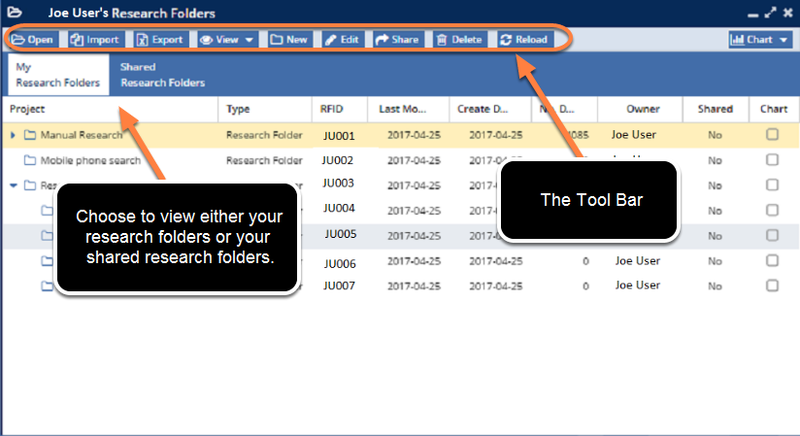 To open a Research Folder and view the contents, double-click the folder and the standard Search Result grid will appear. The window title shows that you are working in a folder (1). The name listed will match the Project Name so that you know what folder you are working in at any given time. Notice in the figure above that the query field (2) in the Refine Search panel is empty. The query behind the scenes is RFID:JU001, which you can visually see in the Filters Applied section if you scroll down below the Search Options field. Note: When you open a folder from your Research Folders, it will not have anything in the query panel because it really isn't running a search the way you think of it. The system is pulling up the list of documents you saved to the folder. This is a static list. So if you ran a query and then saved those results to a folder, those results would stay the same no matter when you opened the folder. If, on the other hand, you ran a query and then saved the search (not the set of documents) to your Research Folders, when you opened that search, the results you get from one day to the next may change. This is because it is running the search again on the entire corpus of the patent data. If documents have been added or updated since you last ran the search, the search results could change. 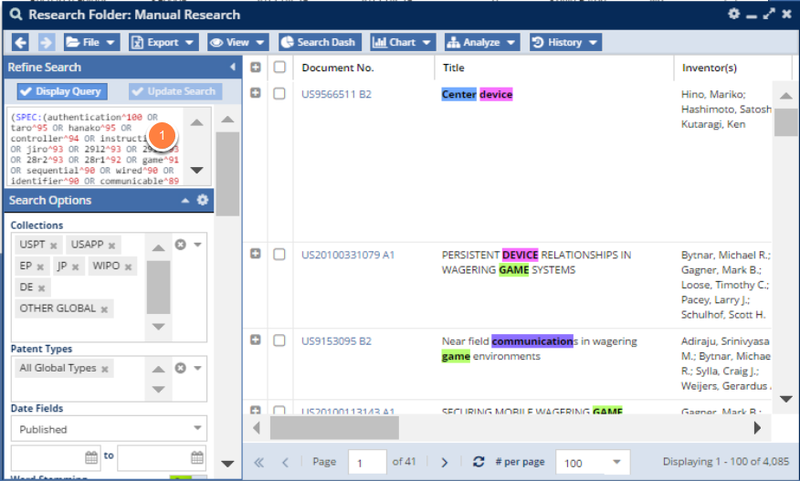 You can search for documents inside of a specific research folder by typing your query directly into the query field (1), or by using the filters and facets to further refine your results inside the folder. In this example, I used a sophisticated claims keyword search to not only search within the folder but to rank (sort) documents by their relevance to my query.